Jordon McKenzie, seen here in action against Griff, scored two at Pershore. Racing Club Warwick reacted in style to Saturday’s 9-1 hammering, producing a thoroughly professional display to win 4-1 at Pershore Town in Midland League Division One. 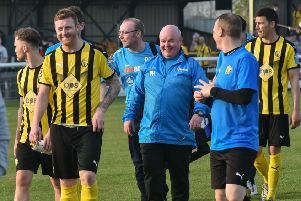 With skipper Tom Reynolds passing a fitness test and Conal Dowling back between the sticks it looked a far more solid team from the depleted side that had caved in against Nuneaton Griff. All the goals came in the second period. Jordon McKenzie broke the deadlock just before the hour-mark, racing through to round the keeper and calmly slotting home. Eight minutes later he added a second, bamboozling a defender and cutting inside before smashing the ball past the keeper. In the 72nd minute, Daniel Dineen stepped up to curl a sublime free-kick into the top corner after McKenzie was fouled. Jake Hargreaves added a fourth after cutting in from the left flank and a late Pershore consolation courtesy of Daniel Carter could not take the gloss off the victory. On Saturday, Racing Club produced a shocking performance against Nuneaton Griff to undo all the good work of their opening four Midland League games. With no recognised goalkeeper and five defenders missing it always looked like being a struggle, but there were no excuses for a lack of passion and desire which saw Griff score six second-half goals. Substitute Junior Bennett scored the Racing Club consolation. Racers are at Heather St Johns tomorrow before entertaining Southam on Bank Holiday Monday (3pm).